This chair isn’t actually upholstered in leather (even though it looks like it is), I’m going to research this chair and write down my Boss Wingback Traditional Chair, Black review right in this article. It does contain many mixed feedback, so I thought that’s all the more reason to properly research this product and see if it is worth getting or not. Should you actually get this chair or not? I will answer this this question and a lot more in my review below. If you want to be in your office like a boss, this might just be the office chair for you. Let’s see what else this chair has to offer besides looks, shall we? The Boss Wingback Traditional Chair is designed for ultimate comfort and available in 2 colors (Burgundy and Black). It’s not actually real leather, but rather upholstered in vinyl. This chair does contain a gas lift so you can adjust the height, and it also has a tilt back option. However it doesn’t say anything about it in the description. To clean it, it requires only mild soap and water and the instructions for this are located on the single side. The wood compartments are finished in a nice elegant mahogany color, which I find to look awesome with the Black and Burgundy upholstery. What I find to be the most beneficial aspect is the amount of comfort this chair provides. It pretty much NEVER loses its padding abilities, which makes this chair stand out from the crowd. I also like that it will not fade (considering it’s not left in direct sunlight for long periods) or flake, while lasting you for years to come. For the price you pay of course that’s something you should expect anyway. This chair can be purchased straight from Amazon.com. This will include a 30 day return policy so you can return it for a refund if it has any defects, or get an entire refund if you are simply not satisfied. The price of this product varies between $250 and $350, so I’d rather you check out the current price to see what your options are. This tends to be good for people who are on the larger side and want something to fit in comfortably. Anyone over 6 foot will also find that the back of this chair DOES come up over your shoulders, so it is a good choice for tall people as well. Although I would recommend a maximum weight capacity of 300 pounds just to be on the safer side. It has a very professional look and appears exactly how it does in the photos, if it looks like something you want then it is definitely for you. The Boss Wingback Traditional Chair will work perfectly in an executive-styled office. Definitely not for a child or student that wants to study or do homework. It is too big and bulky, and frankly, way too expensive for this sort of usage. This will be a waste of money for a space filler, as there’s better alternatives for using a chair in this manner. To be totally honest with you, I would say yes, for the simple fact that it’s high quality and easily stands the test of time. The negative reviews are nothing major and there’s also not many of them. However there is a a very slight chance of getting a bad/defected product, and out of the many purchases, this almost makes the chair a definite buy. If you want something a lot cheaper and still having the ability to last a long time (although not AS long), you should still check out my review on the Serta Executive Office Chair. 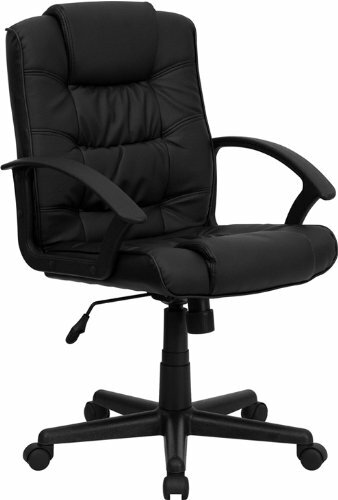 However you can steer clear of these executive chairs altogether and go straight to a mesh back office chair. This one has been proven to be high quality, and has your health and lower back needs in mind. Read my Boss Mesh Back review here to learn more. Overall it is a great looking chair and definitely a good alternative for actual leather. If it was leather you’d probably be paying $500+, so this is something to consider. If you don’t want to pay an arm and a leg for the leather upholstery but still want the traditional classy look, this is a great chair! In all honesty, it is what it is. What you see is what you get, literally. Simply because it looks exactly how it does in the photos and will last you for many years (considering you are looking after it). And since there’s only a few minor issues when people have been delivered this chair, there’s not really much to worry about. I’ll give you my honest opinion, but take it as a grain of salt. I wouldn’t pay this much for this chair. NOT because it isn’t high quality or anything, because it is, but I’m just not a big fan of these types of bulky seats. But if you are a fan of them and are still on the fence for whether you want to purchase it or not, I will say go for it. At the end of the day, you can still send it back for a full refund if you decide you don’t want it. The pros and benefits are heavily outweighing the cons and negative feedback, for those reasons and more outlined above, I would say this chair is highly recommended!